Do you sometimes scream into a pillow at night because you have so many plans but you are too afraid to execute them? Because I do that, regularly. Whenever I come up with things they mostly get put off because I am afraid of publishing things. Fear holds me back! Asking for the things you need or support can be scary. Trying new things and putting yourself out there is scary. Granted, the amount of fear I feel might not be normal, but I do know that many people feel this way. You might not feel comfortable if people find out about your newest business ventures. Or maybe you’re just insecure. There are so many moments you can feel scared while being the sole boss of your blog and business. 1. 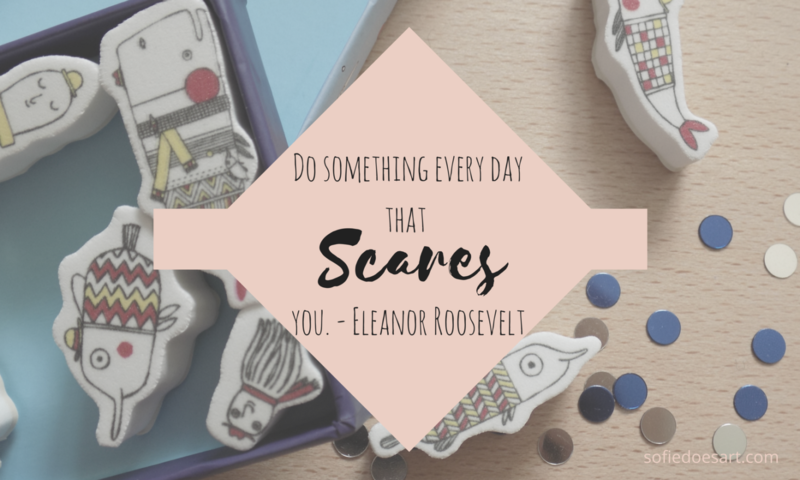 Do things that scare you! Even though this sounds like a terrible idea, the only way things can get less scary is if you do them more often. You can not only get better and being less scared of things (like writing emotional blog posts). You can also get better at doing things even if you are terrified. Good blogs and businesses take risks and put themselves out there. 2. Write down the benefits of what you are doing. For example, you are dreading sending that email pitch because you are thinking of everything that could go wrong. Instead of thinking about all that could go wrong, write down every benefit. They will know your name, maybe even reply. It will be an amazing opportunity for your blog. 3. Sort fear into realistic and unrealistic. Not every fear you have is a realistic one. I see myself doing this all the time. For example, when you send an email. If you are afraid you might not get a response that is realistic but shouldn’t keep you from sending the email. I am mostly afraid I might bother someone, but that is for them to decide so that shouldn’t stop me from sending the email. If you are afraid of getting an angry email back, that would probably not happen (unless your email was an angry one as well). Unrealistic fears are keeping your blog back without any good reason. Recognizing these fears is the first step to overcoming them. Everybody always says this. You need a business or blog buddy. When you are scared about new posts, emails or more who can better understand you (or proofread) than someone who has already been there. If you have yet to make a blogging business why not try a facebook group. There are many where you can ask for advice or for someone to proofread for you. When you get someone else’s advice it might all look a little less scary. If you can’t find a business bf and facebook isn’t your thing maybe just ask someone you are close with in real life to help you. Maybe they can read or look at the thing you are working on. Even if they might not be professionals they can still tell you they like it. Sometimes it is just that little push that can help you! Now I am not saying the fear ever goes away entirely. But I do think you get better at handling it. If you can feel every bit of fear matched with just as much excitement for your projects it will be so much more easy. It is important that you can push yourself beyond your boundaries. But you can always start with a little step. Tell me; What little step can (and will) you take that fears you? Personally, I will be writing some good e-mails! Help! All the topics I come up with are already used!